License lost due to a drunk driving conviction? If you've been arrested for a DUI in Michigan, it's likely that your driver's license has been confiscated.The police are required to confiscate your license if you fail a chemical test (0.08 or above) or refuse to submit to a chemical test pursuant to a court order. If you fail a breath test, you will be given a DI-177B license, which is a temporary driving permit. If you submitted to a blood or urine test and the results are not available yet, you will be given a temporary license, but if the results come back under a 0.08, you will be re-issued your ordinary license. If you refused to give a sample, you will be issued a temporary driving permit along with a form (DI-93) that is a request for an implied consent hearing, which should be sent to the Driver Assessment and Appeal Division (DAAD). You have 14 days from the date of your arrest to request an implied consent hearing from the DAAD, which allows you to make the police prove four issues at a hearing. If you do not request a hearing within 14 days this will cause an automatic one year suspension of your driver's license, and a two year suspension if this was your second refusal within seven years. Once the implied consent hearing is requested, it must be scheduled within 45 days, and be resolved within 77 days. With these particular scheduling procedures, it's likely that you will appear in court for the misdemeanor charges before attending the implied consent hearing, which is to your benefit. Having a pre-trial prior to the implied consent hearing will allow your attorney to receive discovery including all police reports generated from your arrest. A first refusal results in a one-year Michigan driver's license suspension, and a second refusal in seven years results in a two-year suspension of your license. At the hearing there are four issues. The answer must be yes to all four issues in order for it to be a valid refusal. 2 - Was the defendant placed under arrest for one of these crimes? 3 - Did the defendant reasonably refuse to submit to a chemical test requested by an officer? 4- Was the defendant advised of his or her chemical test rights? First time offenders can petition the circuit court for a restricted license, but repeat offenders cannot. The refusal under the Implied Consent Act is a civil infraction, which has no affect on the criminal proceeding, but it is also not discharged if you are acquitted on the Michigan drunk driving charges; it's a totally separate charge. In addition to license suspension, refusing a chemical test could result in six points on your license. So you can be acquitted of drunk driving, but still get six points on your license for refusing a chemical test. There is no plea bargaining at the implied consent hearing, but if the officer does not show, you will keep your license. The defendant has the opportunity to testify at the implied consent hearing, but does not have to take the stand. The defendant's testimony should only address the four issues at hand. If you fail to appear in court or fail to pay fines or costs, the court will inform the secretary of state who must then suspend your Michigan driver's license; the license will not be reinstated until the court informs the secretary of state that the matter has been resolved. If your license has been revoked by the Secretary of State, you can appeal for reinstatement with the Driver Assessment and Appeal Division (DAAD). The DAAD is the only avenue to appeal a revoked or denied license due to multiple Michigan drunk driving offenses. If your license is currently revoked, there is no immediate action to take. If you have entered a sobriety court, you may have been issued a restricted license. The DAAD is the governing body that approves the removal of an interlock device under the Michigan Super Drunk Law. If you are serving your first revocation, and your one-year non-appealable revocation has passed, you may be eligible to appeal the subsequent denial of the license to the DAAD. If this is your second revocation, you must wait a five-year period before being able to appeal a subsequent denial. During your mandatory suspension, the DAAD will send you a package containing material that is meant to guide you through the early steps necessary to improve your chances of winning an appeal. The packet is geared toward substance abuse, and it gives you the ability to setup an appointment with a substance abuse therapist or agency for an interview and evaluation. When you go to your interview, you should bring a copy of your driving record from Michigan, and any other statement which you have lived in the past ten years. You should also bring letters of sobriety, therapy, treatment and your substance abuse evaluation form, which was mailed in your packet. - The risk of repeating past abuse is low or minimal risk. At the hearing you should have a witness who will testify to your sobriety; the more contact this person has had with you, the better witness they will make. You should be ready to discuss the steps you have taken to find sobriety in great detail. If you are denied a Michigan restricted license, the hearing officer may want you to seek further treatment before driving. If you are successful in receiving a Michigan restricted license, you must have an ignition interlock device on your vehicle. Once you have the restricted license, you can eventually apply for an Administrative Review, which is a hearing to be granted full driving privileges. Sometimes it is advisable to have a face-to-face meeting for this review, but it is not mandatory. For this hearing, you will also need to submit community proofs from three sources that speak to your sobriety. Only one administrative review is allowed per year. You should have an attorney represent you during this process. Michigan driver's license points are only entered for the highest infraction. For example, if you are cited for multiple offenses of Careless Driving (3 points), Operating While Intoxicated (6 points) and Limited Access Speed 6-10 Over (1 point), you can only receive 6 points on your license. If you accumulate 12 or more points within 2 years, this will cause a re-examination by the Michigan Secretary of State. At this hearing, you may have your license revoked, suspended or restricted along with other terms imposed on your driving ability. If your license is suspended or restricted, this decision can be appealed to the circuit court, but a license revocation cannot be appealed by your attorney. Here are point breakdowns for common offenses, pulled directly from the secretary of state website. Your attorney will be able to give you a more in-depth breakdown of your particular offense, and the impact on your license. What are my options if I lose a Michigan implied consent hearing? If you've lost your Michigan implied consent hearing, you may be able to appeal this decision. A defendant can appeal the decision of the implied consent hearing on written motion of the party for reconsideration under three circumstances. 3) A material mistake of fact was made by the hearing officer. A motion for reconsideration or rehearing shall be filled with the division office in Lansing and served on the opposing party if any within 21 days after the date of the hearing officer's decision. Not having a license can be a real hardship on your ability to work, and take care of your family. I understand this, and want to answer your questions. If you have been arrested for a DUI in Michigan, and refused a chemical test, you no longer have your driver's license. This article is about winning the Implied Consent Hearing in order to get your license back. The first issue is whether there was a reasonable grounds for your arrest. The police officer must have a reasonable belief that you have committed a Michigan drunk driving offense. An officer will usually point to a combination of factors that lead to his reasonable grounds for the arrest. The standard is preponderance of the evidence rather than beyond a reasonable doubt, because this is a civil matter. If the officer can only point to one factor, which lead to his or her reasonable grounds, your attorney will argue this is not enough, and you may win the hearing. 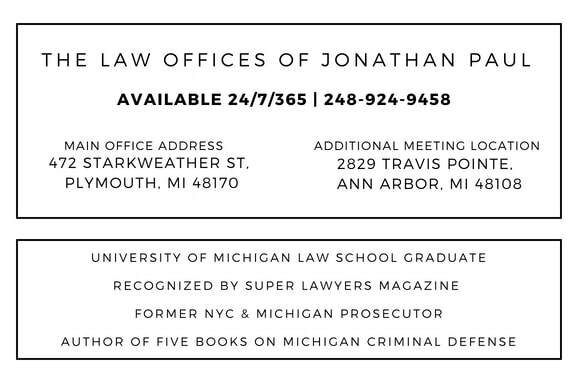 The second issue the police officer must show that you were placed under arrest for a Michigan drunk driving offense. There must be a valid arrest in order to meet this second standard. One example of an invalid arrest is based upon jurisdiction; if the police officer never observed you driving in the officer's jurisdiction then makes an arrest outside the jurisdiction, this is an invalid arrest. If you are not initially arrested for a Michigan drunk driving offense, and refuse a chemical test, this refusal would not qualify under Michigan's Implied Consent Act. The third issue is whether you refused to submit to the chemical test at the request of the officer. If you are found to have reasonably refused, it does not count as a refusal under the Implied Consent Act. Many defendants have challenged this issue, stating that they requested independent tests instead of the one offered by the police. The current law states that the defendant has a right to an independent test only after they have taken the officer's choice of test. If a defendant requests an attorney before taking any test, the police will usually allow the defendant an opportunity to make a phone call to an attorney regarding the breath test. Courts have ruled if the police do not grant this opportunity, and the defendant refuses, it is deemed a reasonable refusal. A point of confusion is whether the defendant has a time limit to decide to take the breath test. The general guideline states that if the defendant takes more than an hour to decide to take the test, it is deemed a refusal. The examiner at the Implied Consent Hearing will evaluate the exact circumstances behind the refusal and decide whether your refusal was reasonable. The last issue in the implied consent hearing is the police must prove that the defendant was advised of his or her chemical test rights. The officer is required to read these rights in their entirety. There are cases where the officer does not read the rights, but it's the officer's word against the defendant. Police videos can be very helpful in determining whether the police complied with all four requirements.